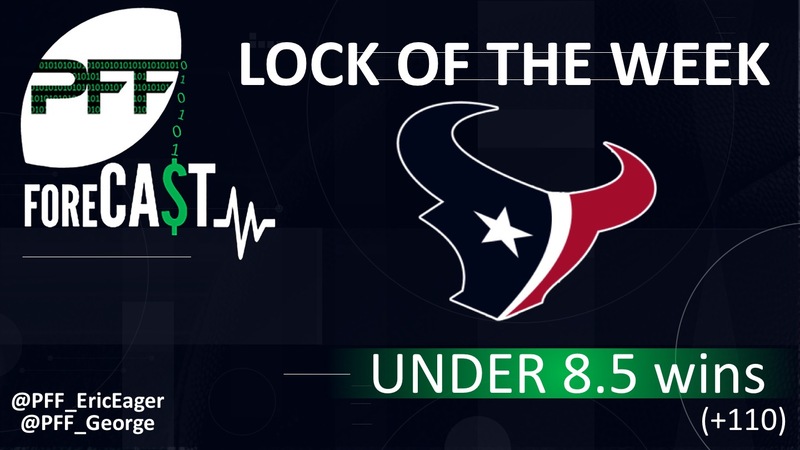 The NFL regular season is almost three months away and while that may still seem like an eternity, we at the PFF Forecast are tiding you over with our third (serious) Lock of the Week this week with the under on the Houston Texans’ win total. In late April, we picked the over on Cincinnati‘s win total (which has subsequently moved) and the under on Oakland’s (which has gotten more expensive in some places). In May, we gave out our way-too-early picks for the season’s first week for those with an interest in the early lines. Today, we talk the Houston Texans. Our Locks of the Week a season ago were 14-6-1 (70 percent), while our weekly column of five picks rung in at 57 percent. 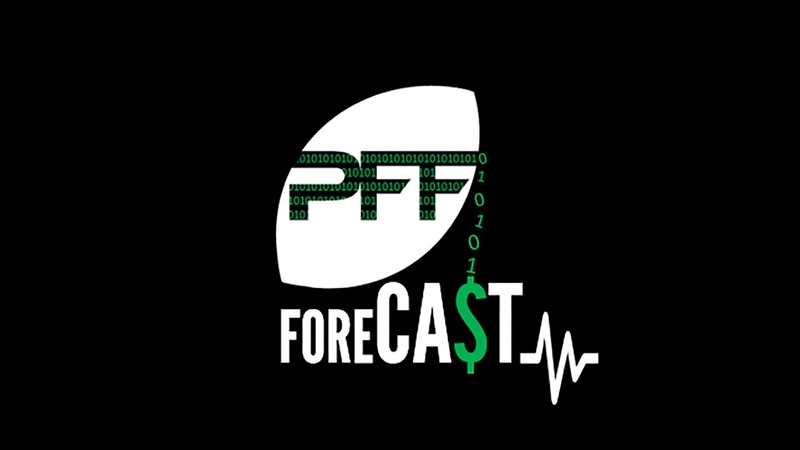 During the 2018 regular season, our picks will be available via PFF Elite and over the air on the PFF Forecast podcast. First, Watson was very encouraging as a rookie, throwing 19 touchdowns in just six starts. However, his PFF grades and accuracy numbers in stable situations are less impressive than his statistics in less-stable situations, or situations that are less due to his ability and more due to his supporting casts. For example, he was just 17th in PFF grade from a clean pocket (stable), while ranking first in big-time throw percentage and expected points added on non-NFL Throws (unstable). While we’re certainly building in some improvement into our projections, he will likely need to be a top 10 quarterback in PFF grades to overcome other deficiencies along the offensive line and defensively for Houston to have a winning season, which is a big ask. Second, Watt’s return (along with that of Whitney Mercilus) has the potential to make the Texans an upper-echelon unit in terms of pass-rush/run defense. The problem with this is that it’s limiting in terms of team success if not paired with good coverage. As stated on a previous PFF Forecast, teams in the upper quartile of PFF pass-rushing grades but in the lower quartile of PFF coverage grades average only 7.26 wins per season. While Tyrann Mathieu, Justin Reid and Aaron Colvin all have the potential to be solid additions to their secondary, there’s too much of their defense that relies on Johnathan Joseph (34 years old), Kareem Jackson (30 years old, 52.2 PFF grade a season ago) and Kevin Johnson (the league’s lowest-graded cornerback in 2017) for my liking. Lastly, the opinion that the AFC South is a weak division is a bit overblown. In addition to two playoff teams a season ago (Jacksonville and Tennessee, who combined for three playoff wins), there are rumors that Andrew Luck (a top-five graded quarterback in the league in 2016) is throwing almost-regulation-sized objects. If we assume Luck plays for the Colts in 2018, our numbers suggest that Houston is the least-likely team to emerge as the champion of the AFC South, making a winning season ever the more unlikely. As we saw on this week’s Bachelorette, some people at PFF can’t fake love. But I am not Mike R. The good news is that Watson differs from the current star of that show to the point where I don’t need to fake it. Watson has everything you want in a QB – tremendous grit, indomitable work ethic, love for his teammates, passion for his city and well below average accuracy room for improvement. This is 2018 and having a growth mindset is a prerequisite for survival. Watson put more targeted throws in an uncatchable location than every quarterback except DeShone Kizer (minimum 150 dropbacks – check out the PFF QB Annual for more of this data). Just making it to the 20-range would be a huge boost in the number of catchable throws for the talented duo of DeAndre Hopkins (90.6 – fourth) and Will Fuller (73.0 – 55th). The Watson-to-Hopkins connection ranked second in passer rating from a clean pocket among duos with at least 50 targets (133.4) and ranked fifth in passer rating versus the blitz (149.6). Watson has huge strides to make at the all important intermediate level of the field. Last season, Carson Wentz improved his intermediate accuracy rate (throws that are perfect or on the receiver’s frame) from the second-lowest mark in the NFL to the best, so it’s not impossible to think that Watson could drastically improve his league-low intermediate accuracy percentage in his second season. As I have no doubt Eric did his duty by mentioning that Watson ranked 17th in PFF grade from a clean pocket last season, I will now descend upon his shoddy take from the top rope. Simply limiting our sample to games started (eliminating the unplanned Week 1 takeover of Tom Savage) Watson would rank fifth. That is just one spot below Russell Wilson. The only issue may be that Watson won’t have too many clean pockets from which to do damage. The Texans’ offensive line doesn’t have a single projected starter with a 2017 PFF grade above 70.0 and only left guard Zach Fulton made it over 49.0. 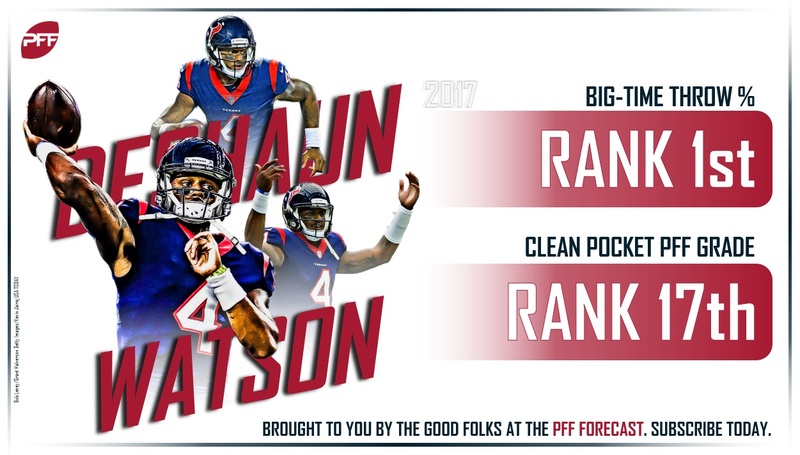 We’ll simply have to hope that Watson keeps up his league leading under pressure big-time throw rate. On the defensive side of the ball there are a lot of question marks. Using the current rosters, the Texans rank just 25th in opponent adjusted PFF grade. We know that coverage is the second-most important facet and we also know that it is relatively unstable season to season, so there is hope for a turnaround with the help of the newly-acquired Honey Badger and hybrid-safety Reid out of Stanford. The pass-rushing situation is one that has lots of promise, but we should remember that Houston is known for producing dominant trios that can’t quite keep it together. The similarities between the Watt, Jadeveon Clowney, Mercilus defensive front and the Beyonce, Kelly Rowland, someone else in Destiny’s Child are more than just the number of people in the group. Most people only know one of them and that one seems to spend more and more time away from the group (or as they say, going solo). The once-dominant Watt has only played 374 total snaps over the past two seasons. In fact, since Clowney entered the league in 2014, that trio has been on the field together for just 13.7 percent of defensive snaps. Clowney, is playing his Kelly Rowland role to perfection: so much promise (87.8 grade in 2016 and 88.3 in 2017), but a looming contract extension may be the Dilemma that ends it all in Houston. There is certainly the chance that these three manage to get one hit song out before J.J. finds his Jay-Z. If not, I propose a name change: since the Houston Space Force appears taken, how about the Houston Survivors? They get a new theme song, pay homage to the toughness of the city and if J.J. never beats the injury bug, he can always work as the mascot/ambassador. The Houston Texans appear a longshot to win nine or more games, but the Houston Survivors? See you at Super Bowl LIII in Hotlanta.